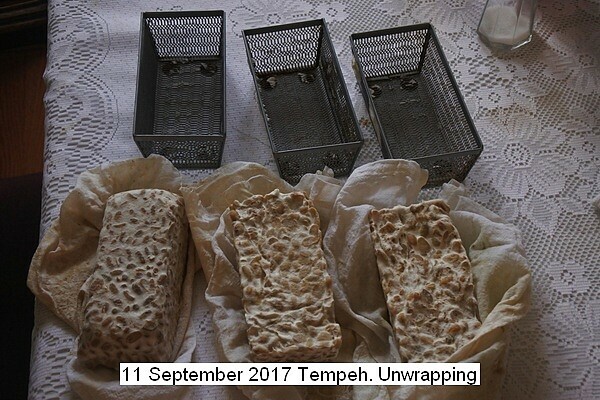 With several batches of tempeh produced and looking for improvements, one major change was adding a spoonful of sugar to stimulate the spores and to increase the incubation time to 30 (24) hours to make the texture more dense. The end produce is perfect. It can be reproduced without failures. Summary of procedure: Five hundred ml of dried soy beans,rinse, boil on stovetop vigorously for 30 minutes, Cool with cold water, rub the beans together to split and to remove skins, flush away the skins. repeat several times, five rubbing/rinsing is about normal. Pressure steam cook the soy beans for 60 minutes one hour at 15PSI. Allow to cool to room temperature and add one tablespoon of vinegar to reduce the Ph slightly. Two modifications were incorporated: fermenting for 30 hours from 24 hours, This makes the finished product more stiff, meaning handling is facilitated; The other is the addition of one teaspoon or white sugar, which appeared to increase the activity of the starter power. Each loaf is from 3 to 4 servings for one person. A pleasant high protein food. This entry was posted in Uncategorized and tagged 11 September 2017 Tempeh, Tempeh). Bookmark the permalink.